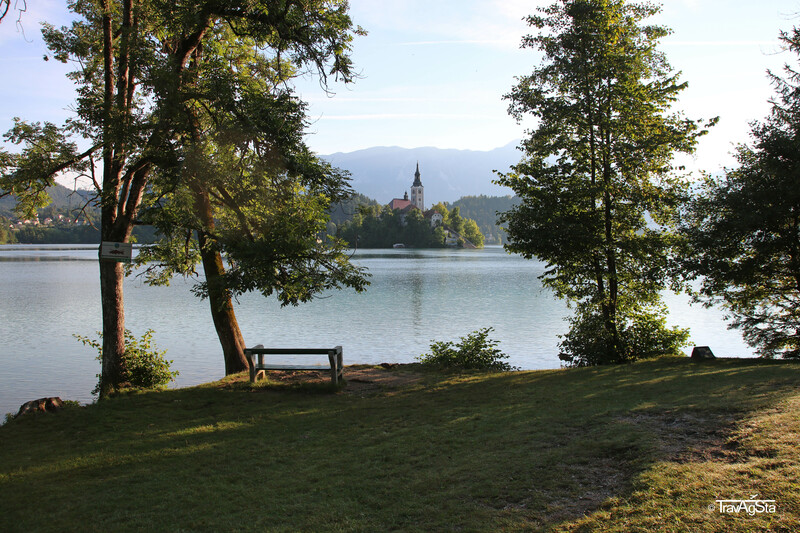 Roadtrip Slovenia – Lake Bled, Triglav National Park and a lot of green! 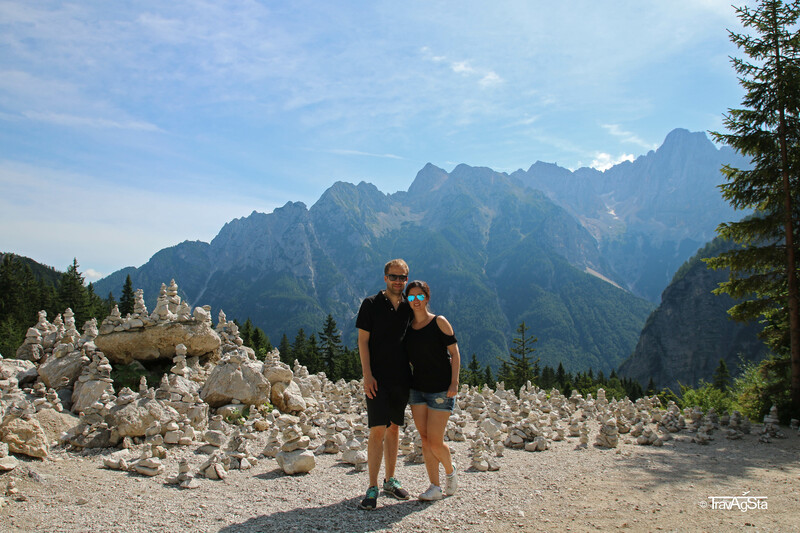 It was roadtrip time again and this august we headed south to Slovenia. This country is perfect for a road trip: It’s small, distances are short and the streets are in top condition. 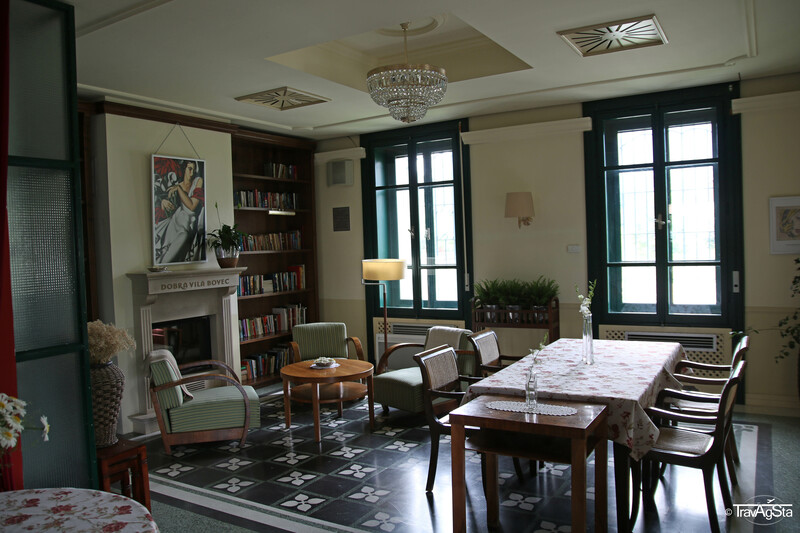 Furthermore there are tons of accommodation and eating possibilities for good prices. This all made our decision easy to travel to this country. Most sights are located in the western part of the country. 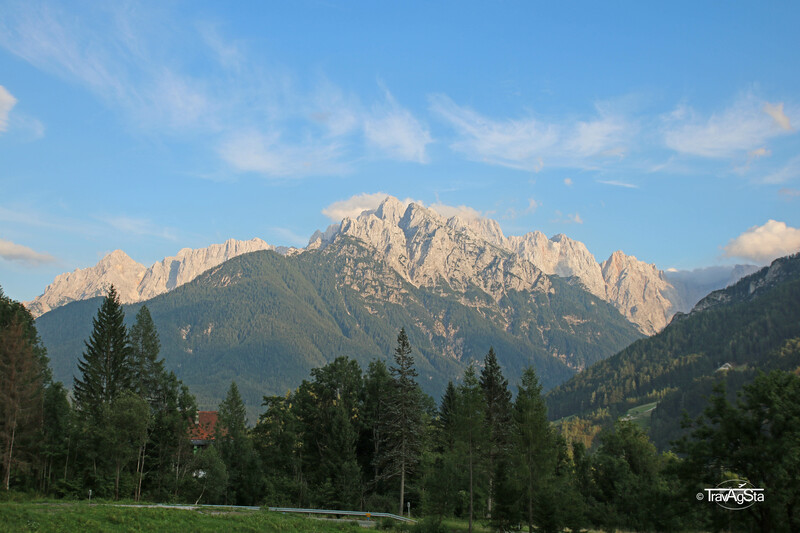 Slovenia is an evergreen Alpine country and Jan I played the game ‘Austria or Balkans’? Driving through the country will show you why. Some things and places reminded us of Austria, some of the Balkans. The reason for this lies in the history of the country which we don’t want to write down in detail as you can read it everywhere else. Short: For several centuries Slovenia was part of the Habsburg Empire; after WW II it became part of Yugoslavia. After its collapse, the country turned more towards Europe. 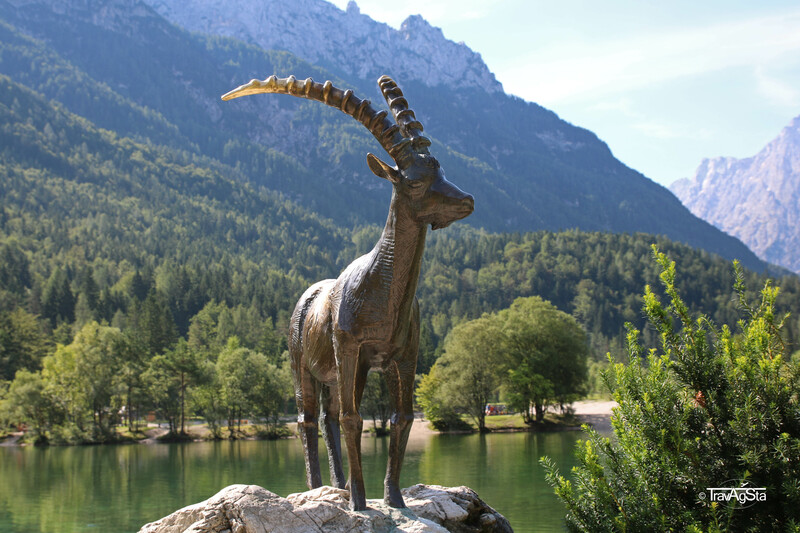 From time to time you might see the statue: It’s the Goldhorn legend ‘Zlatorog’ which has its roots in the Triglav. But you’ll see it everywhere. The chamois is also a logo of the popular beer brand Lasko Pivo. 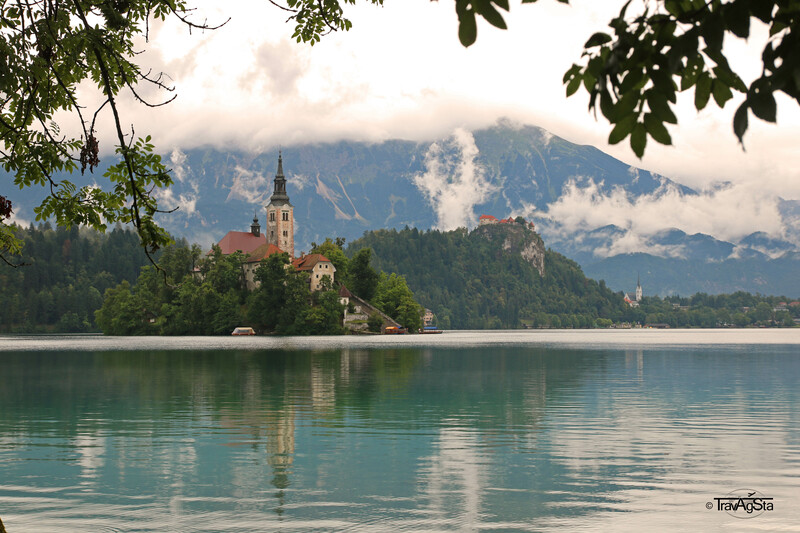 Slovenia is one of Europe’s most underrated countries. Most people just see it as a transit country to make a break on their way to Croatia. Though this small country has so much to offer, especially lots of green. 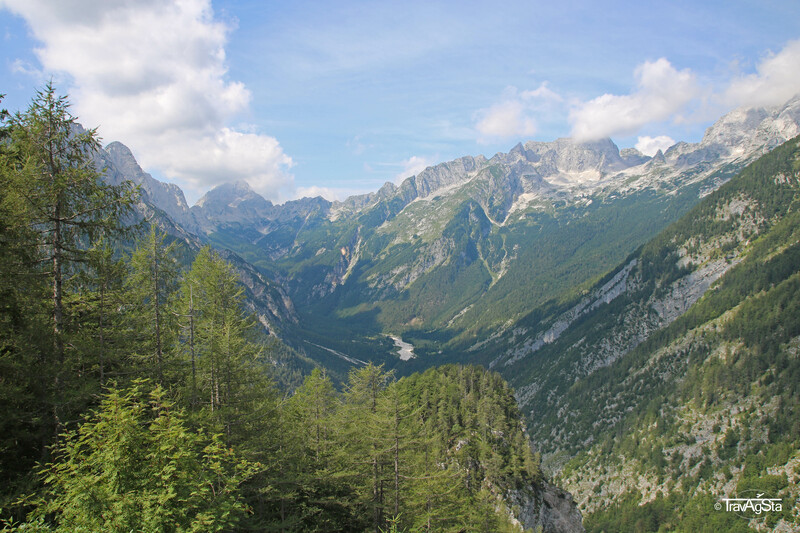 Two third of the Triglav (see below) consists of wood land. The picturesque villages and the good wine which is rarely exported are also reasons. The tranquillity is another argument, because though the country is beautiful only few tourists come here. 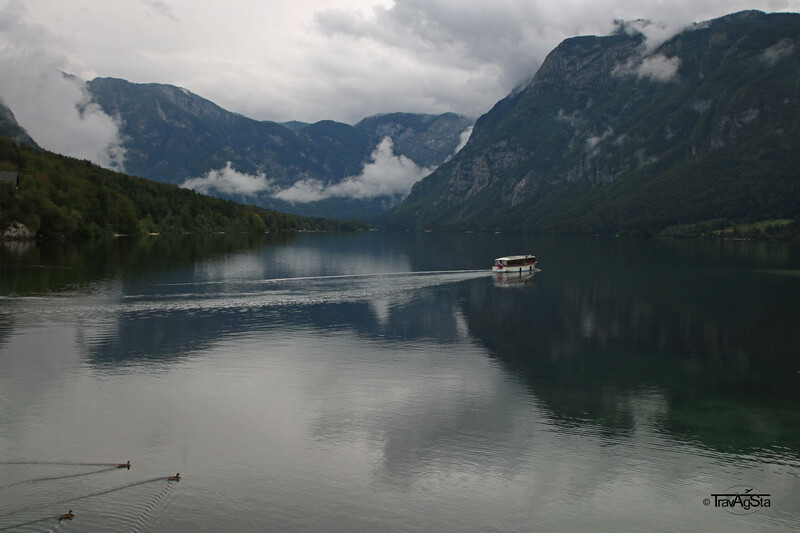 Thanks to the price level, Slovenia attracts more and more travellers. But thank God, there’s still no mass tourism here. In the following we’ll show you some of our destinations during our trip. Part of this trip was also to explore Ljubljana, the capital of the country. We made an extra post for this one. 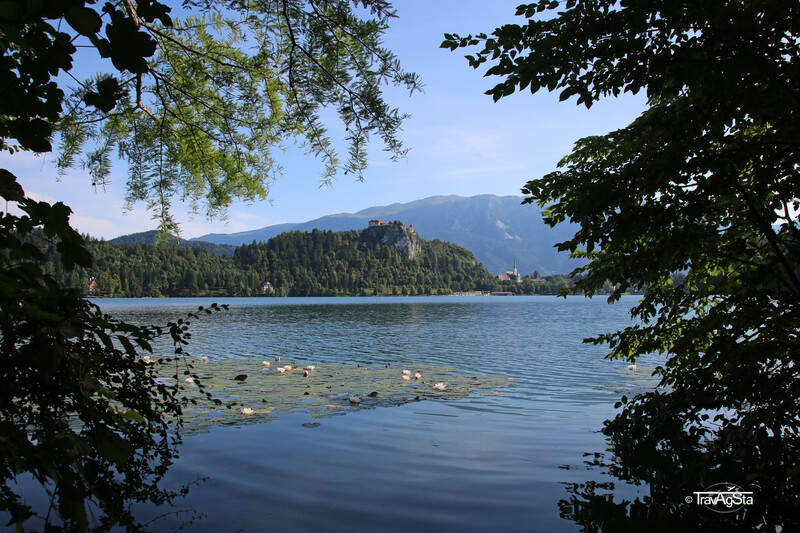 There’s no place where the fairytale of Little Red Riding Hood fits better than at Lake Bled. I don’t know why but just imagine her with her red cape and basket in her hand at this lake. It fits, right? Mother Nature did a great job here and man made it even more beautiful: The island in the middle of the lake with its 99 steps make it all look like a painting. The castle in the background fits perfectly. It’s like something coming out of a painters mind. Before you reach Lake Bled over the highway, you automatically pass the town of Bled which is really ugly and doesn’t fit to the surrounding. Merely the promenade around the see is pretty. And a few Hotel Villas. My favourite point at the lake is the one with the park bench looking directly at the island and the castle. If you want, you can go swimming here. The water is crystal clear and warm. 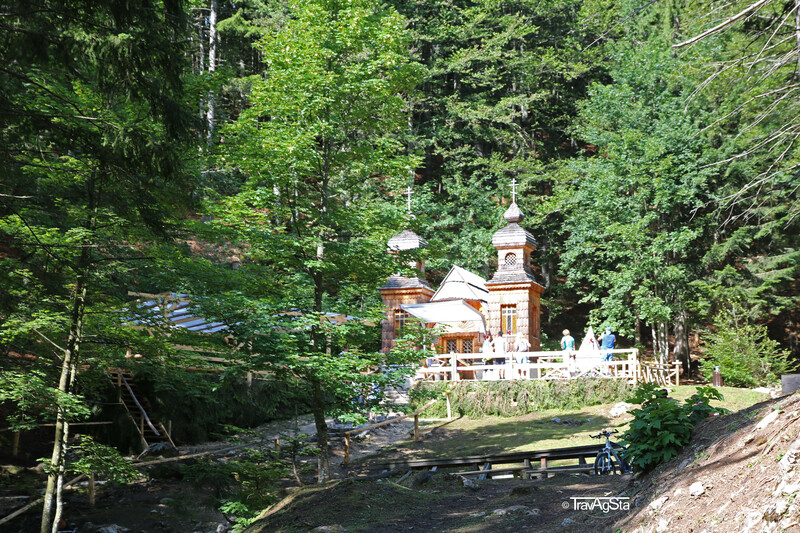 What we can recommend you warmly: Make the hike up to Ojstrica at sunrise. Waking up that early is hard, but the view is totally worth it. The hike itself isn’t easy. It only takes 20 minutes, but it’s steep in parts which is not so cool at this time of the day. But just like I said: It was a lot of fun and totally worth the view. We would do this anytime again. By the way: Besides of heavy rain, there’s no time the lake doesn’t look pretty. 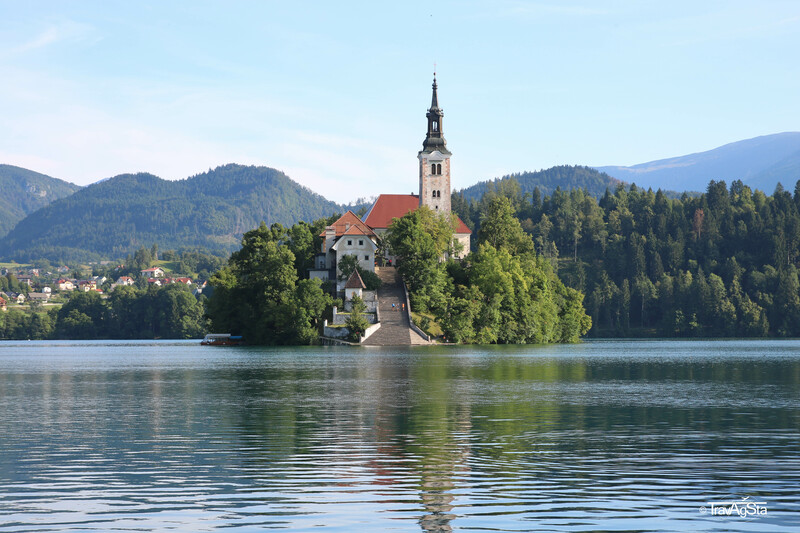 Anyway, Lake Bled belongs to every trip to Slovenia. 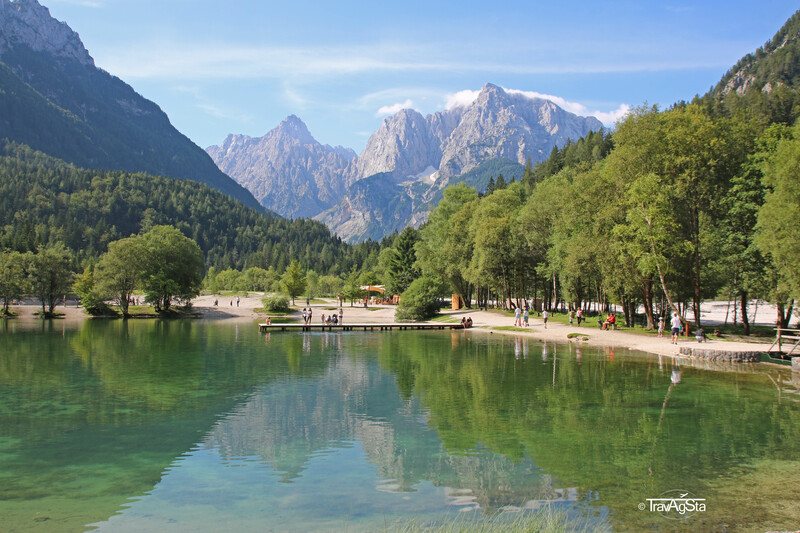 The Triglav is Slovenia’s only national park and is located in the Julian Alps at the border to Italy and Austria. It’s beautiful at any time of the year, though really cold in winter. 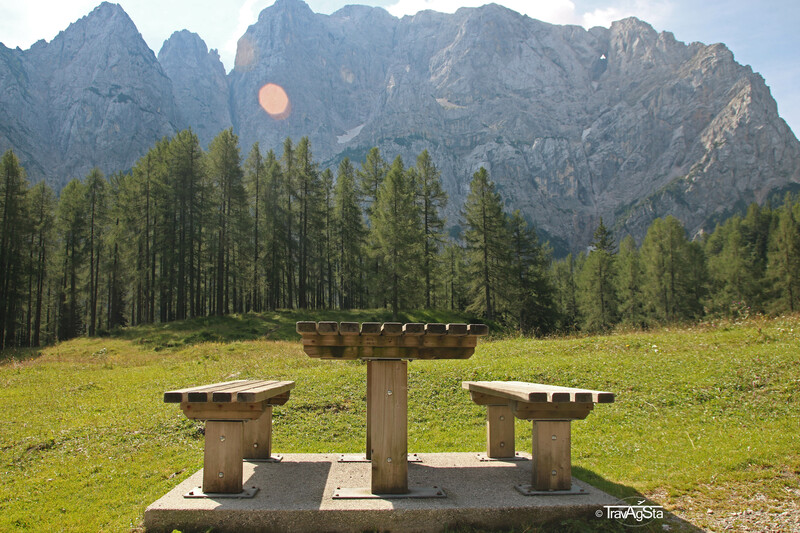 Personally I hope to see the Triglav some time again on a beautiful autumn day, when the leaves are starting to turn. From here we started our trip around the National Park. 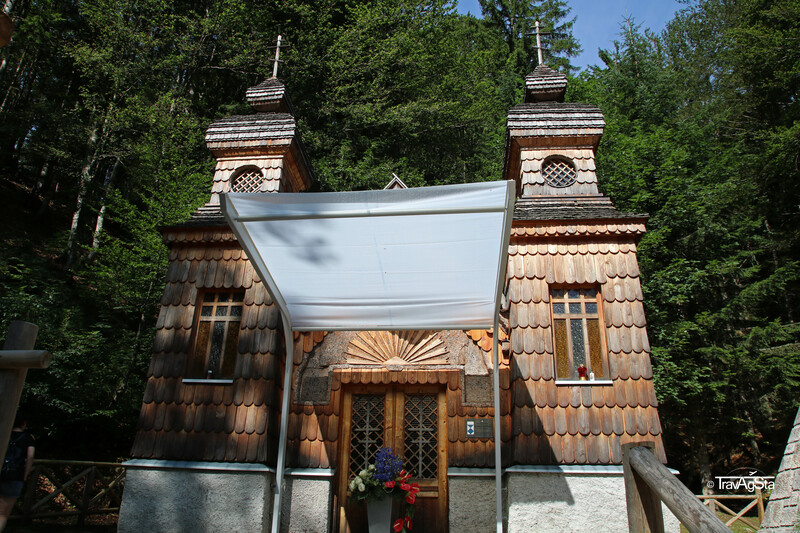 Kranskja Gora is two kilometres from the Austrian border. You can reach it over the Wurzenpass. In winter Kranskja Gora is popular for winter sports. Furthermore, the Russian Orthodox chapel isn’t far from here. As mentioned before, the day we left Germany for our trip was the same Putin took part at the 100 years memorial day for the Russian victims in WW I. The Karawanken tunnel was closed for almost the whole day. With this big hype, we had to see the church as well. It’s small, pretty and hidden in the forest. Nevertheless it’s easy to find thanks to the parking lot and the many tourists here. 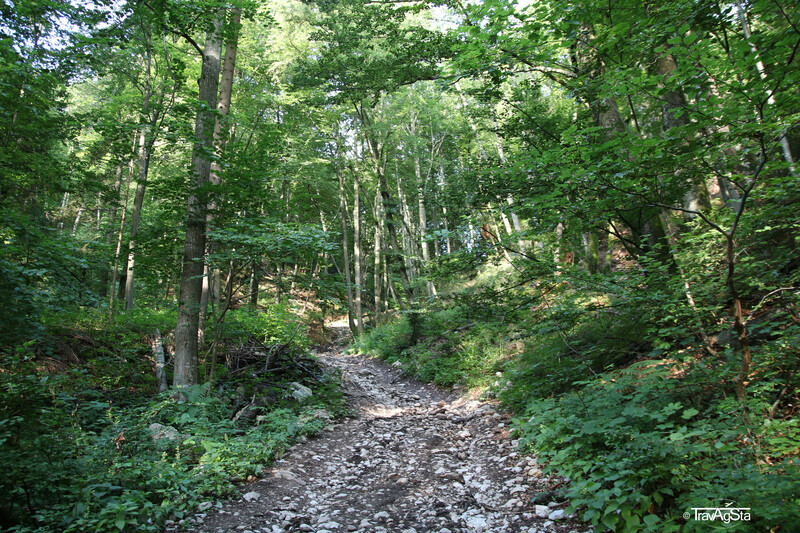 You’ll reach it over the Vršič Pass. Driving over the passes of the National Park alone was worth the visit. We were lucky with the weather and the view was spectacular. Everywhere you look you see mountains and forests. The air up there is so fresh which was all we needed after our long drive through Austria the day before. 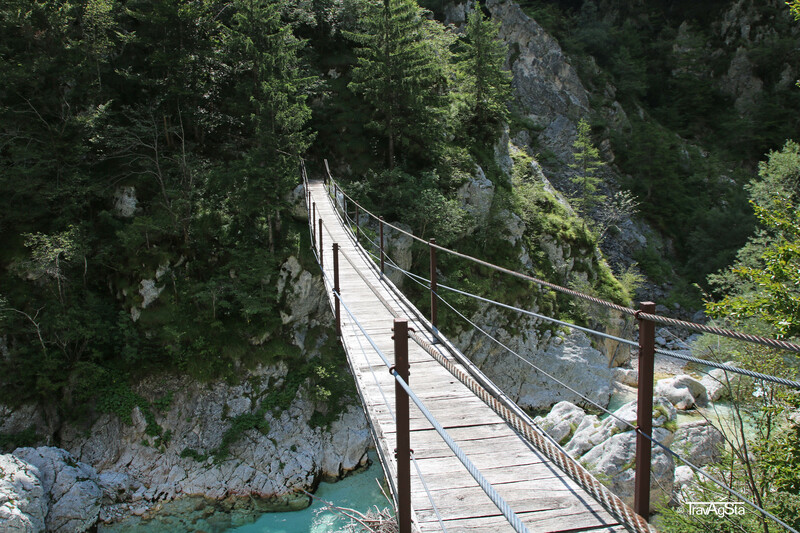 The Soča is a river which has its source in the Julian Alps and later flows in the Gulf of Triest. 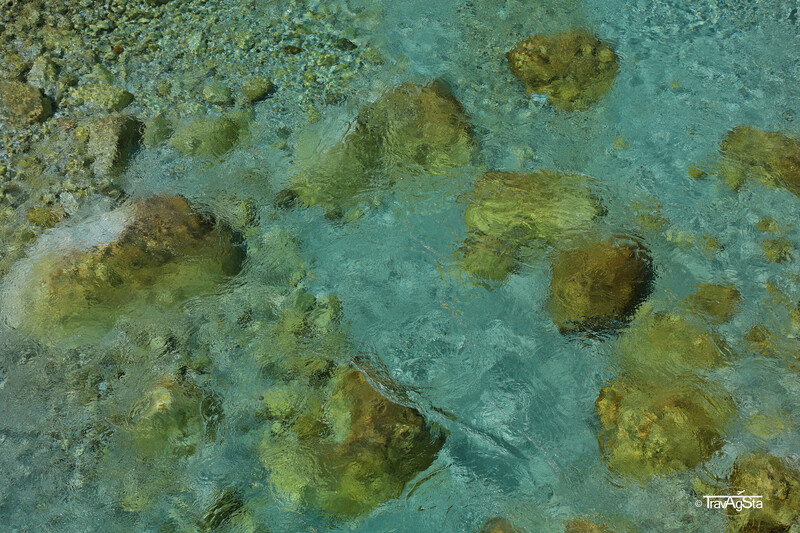 The water is crystal clear and the route along the Soča is amazing. We had to stop many times to take many pictures. Here and there, you’ll spot some shaky bridges from where you can watch the river. The water isn’t just crystal clear and turquoise, it also painfully cold. You can’t stand inside it for long. Our feet were burning afterwards. 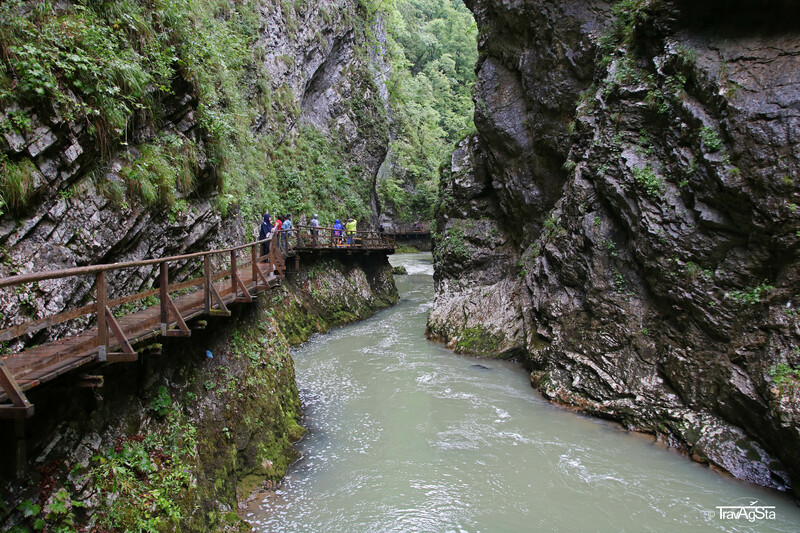 In August the Soča was partly only a rill. In spring it’s probably mightier with a lot of Kajak enthusiasts. 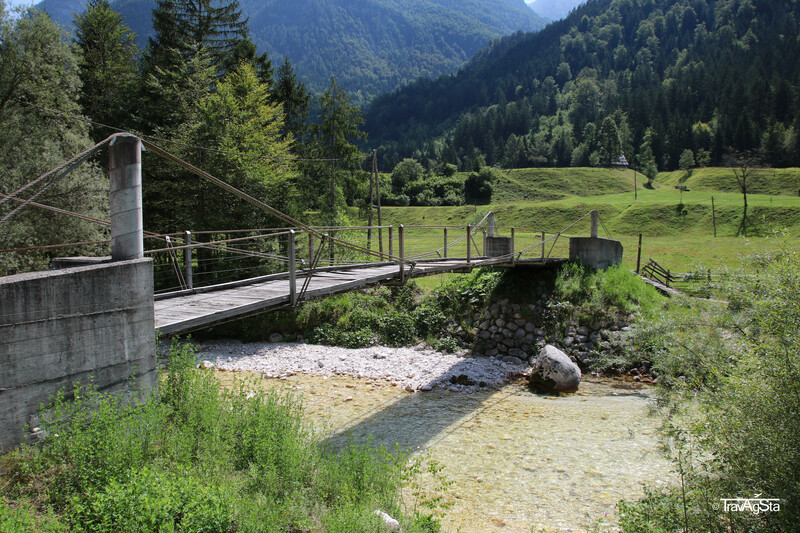 Bovec is a small municipality located in the Soča valley. Here we made a coffee break in one of the cutest hotels of the region. 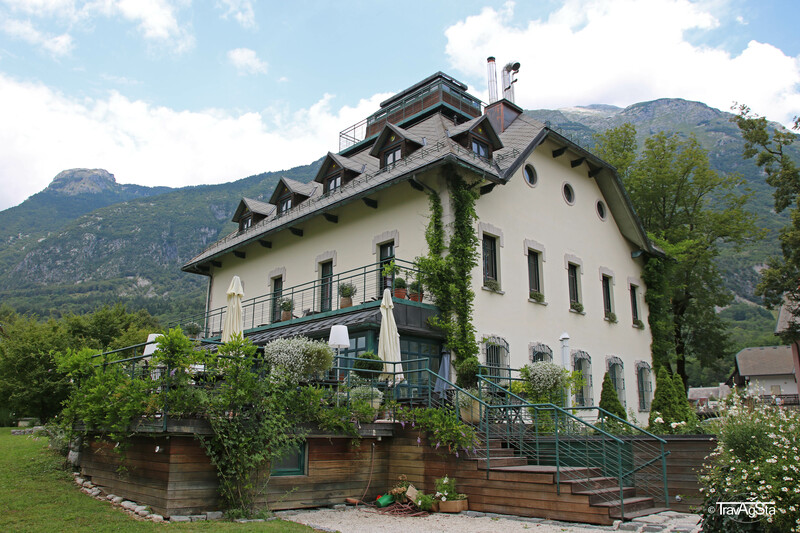 It’s called ‘Hotel Dobra Villa Bovec’ and it’s an old villa with a great garden and good coffee. If you’re searching for a accommodation (and have the money for it), this villa is surely a good choice. We found it later at booking.com and its rated extremely good. You’ll probably find it easier in the maps with the Slovenian name. 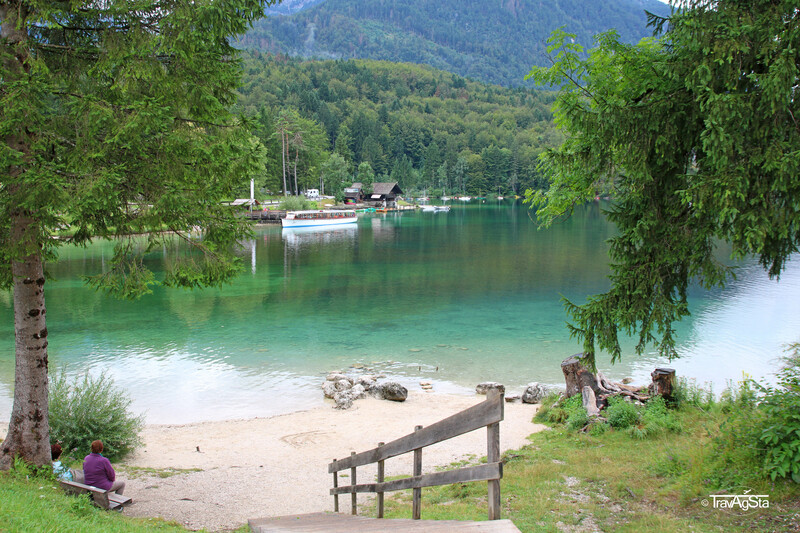 Lake Bohinj is a picturesque lake in the Triglav. 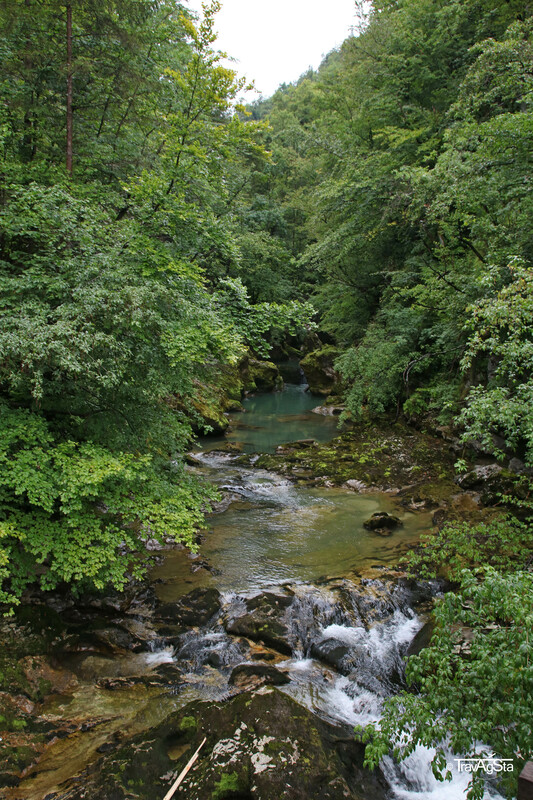 Its main feeder river is the Savica waterfall which we would have loved to visit. But unfortunately the weather turned worse. It’s one of Slovenia’s most famous waterfalls. You should definitely see it. 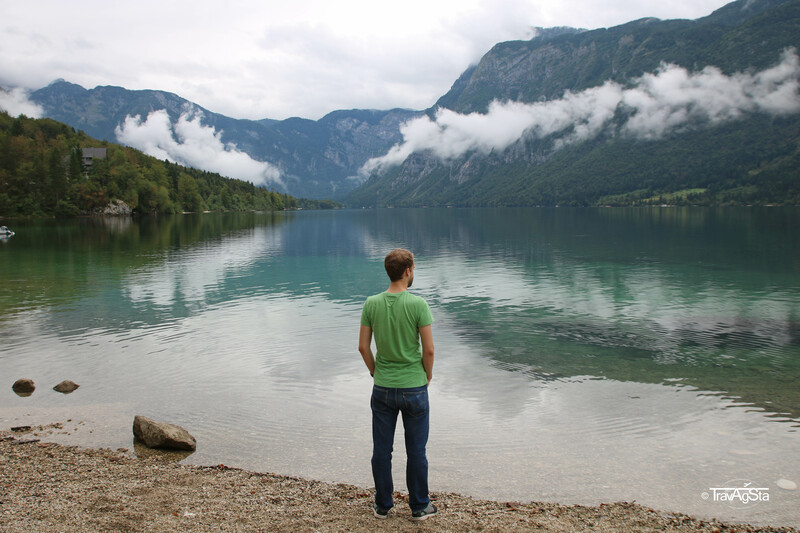 Lake Bohinj is a calm place. 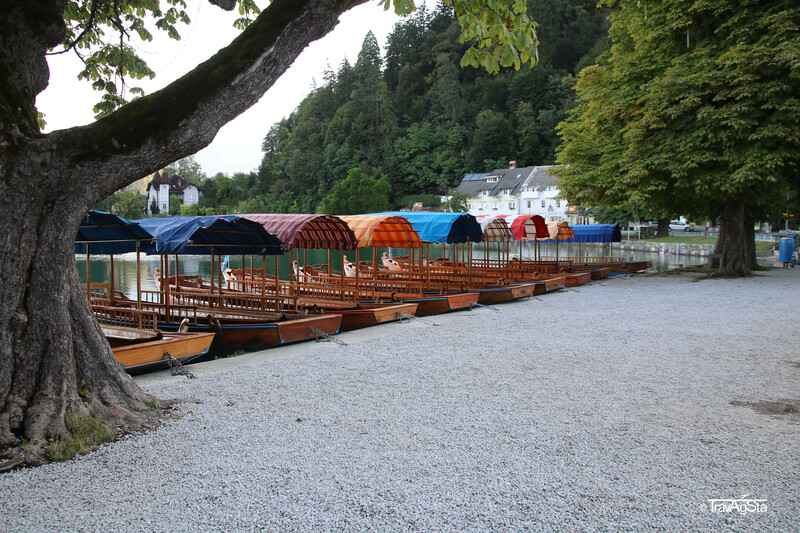 It’s perfect for a boat trip around the lake or just to enjoy the view. 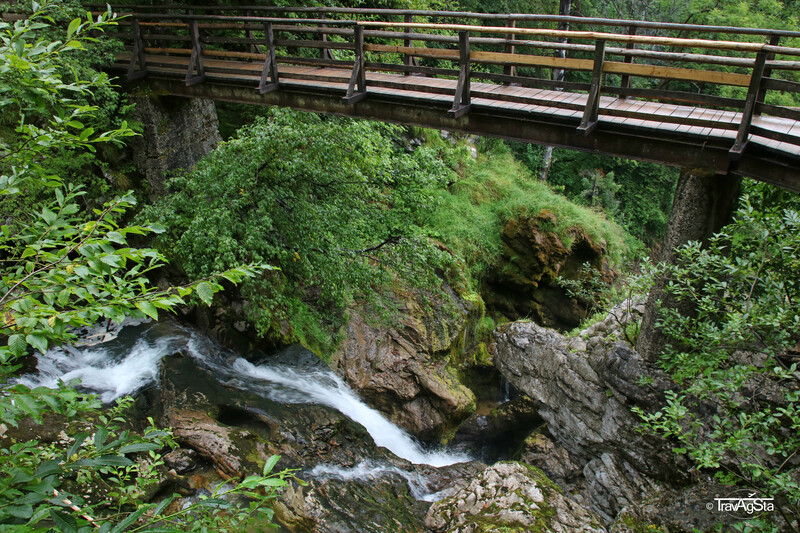 This amazing and fully developed gorge is located near Lake Bled and is therefore a popular spot. 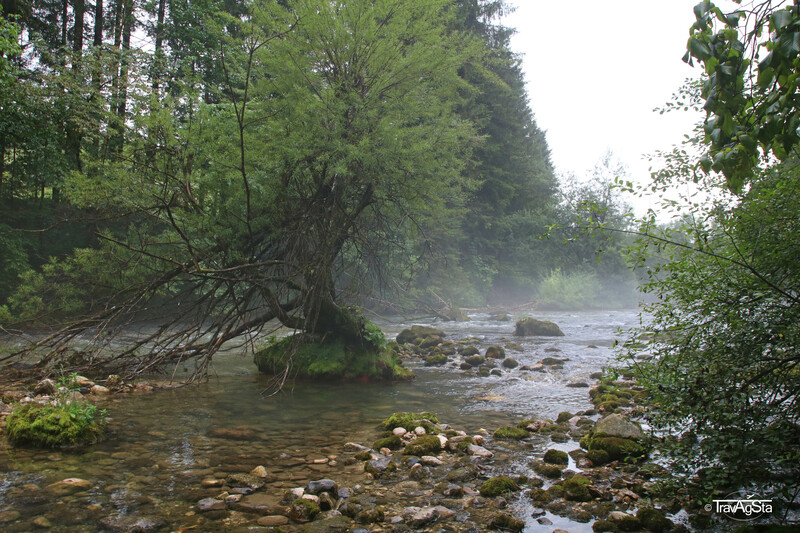 It lies between the mountains of Hom and Boršt and flows, in between flows the River Radovna before it ends at Slovenia’s highest waterfall. Šum is 13m high. 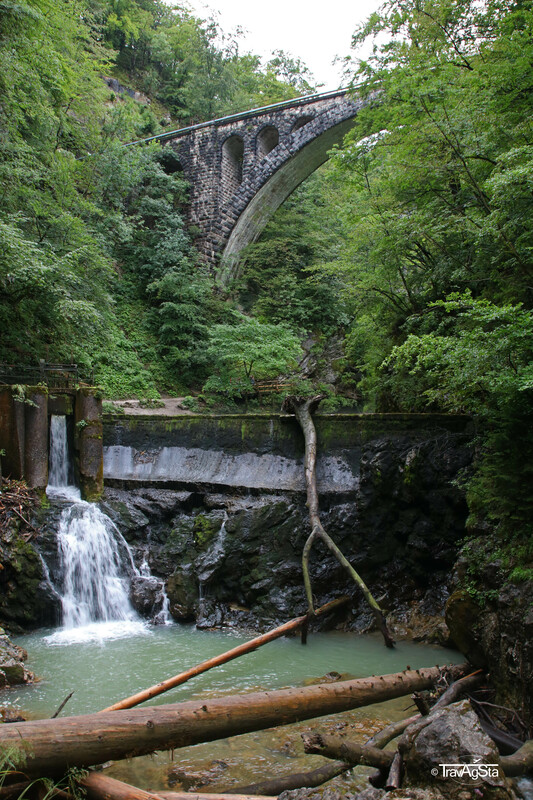 Vintgar Gorge is 1,6km long and has a great green colour. Of course with a cloudy sky, colours aren’t that intense! At some points the ways became really narrow as there were too many visitors. If you’re searching for tranquillity, this isn’t the place for you at least in august. Nevertheless you shouldn’t miss it on your Slovenia trip. You’ll have many great views on your way in this country. Photo stops are endless. When looking at some of the pictures, we don’t even know where we took them as they appeared somewhere in the nowhere. I don’t think it’s important. What’s important: A great country with great landscapes and people. 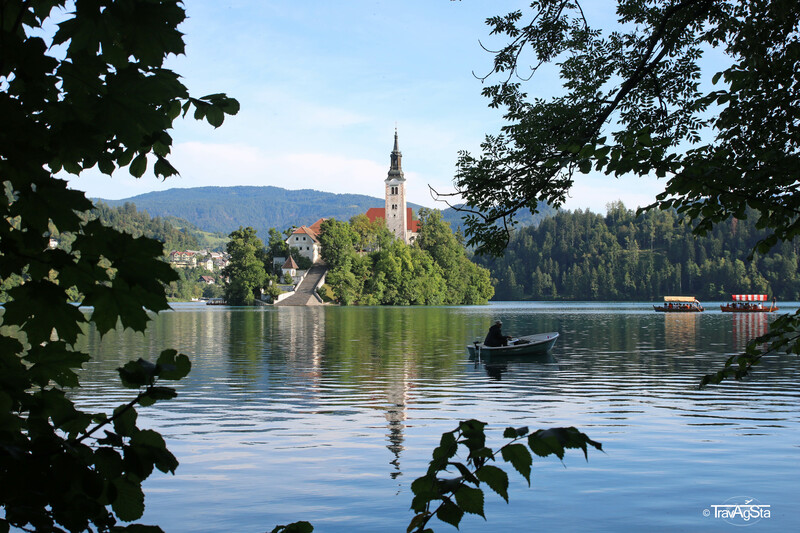 Did you ever think about a trip to Slovenia? Lofoten, Norway: Flakstadøy, Vestvågøy, Austvågøya!